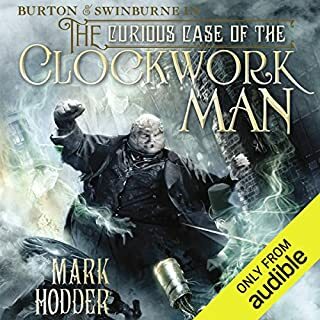 When a clockwork-powered man of brass is found abandoned in Trafalgar Square, Burton and his assistant, the wayward poet Algernon Swinburne, find themselves on the trail of the stolen Garnier Collection - black diamonds rumored to be fragments of the Lemurian Eye of Naga, a meteorite that fell to Earth in prehistoric times. His investigation leads to involvement with the media sensation of the age: the Tichborne Claimant, a man who insists that he's the long lost heir to the cursed Tichborne estate. It is 1863, but not the one it should be. Time has veered wildly off course, and moves are being made that will lead to a devastating world war. Prime Minister Lord Palmerston believes that by possessing the three Eyes of Naga he'll be able to manipulate events and avoid the war. He already has two of the stones, but he needs Sir Richard Francis Burton to recover the third. 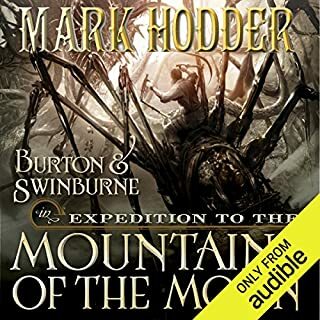 This audiobook shows the origin of the green priests on Theroc, the first Roamer skymining operations on a gas-giant planet, the discovery of the Klikiss robots entombed in an abandoned alien city, the initial Ildiran expedition to Earth, the rescue of the generation ship Burton and the tragedy that leads to sinister breeding experiments. Veiled Alliances is an excellent starting point for readers new to the Saga, as well as an unforgettable adventure for fans of the series. Sir Richard Francis Burton: explorer, linguist, scholar, and swordsman; his reputation tarnished; his career in tatters; his former partner missing and probably dead. Algernon Charles Swinburne: unsuccessful poet and follower of de Sade; for whom pain is pleasure, and brandy is ruin! They stand at a crossroads in their lives and are caught in the epicenter of an empire torn by conflicting forces: engineers transform the landscape with bigger, faster, noisier, and dirtier technological wonders; eugenicists develop specialist animals to provide unpaid labor; libertines oppose repressive laws and demand a society based on beauty and creativity; while the Rakes push the boundaries of human behavior to the limits with magic, drugs, and anarchy. The two men are sucked into the perilous depths of this moral and ethical vacuum when Lord Palmerston commissions Burton to investigate assaults on young women committed by a weird apparition known as Spring Heeled Jack, and to find out why werewolves are terrorizing London's East End. Their investigations lead them to one of the defining events of the age - and the terrifying possibility that the world they inhabit shouldn't exist at all! 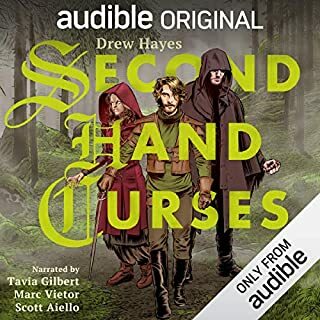 ©2010 Mark Hodder (P)2011 Audible, Inc.
-- similarly, while the coverage of Victorian speech patterns and mannerisms is often a strength of the book, the speechifying in the action sequences (again in the last third) is just ridiculous. It's kind of like professional wrestling where you have to listen to a lot of nonsensical talking to set up a fight and then during the fight people will just stop to talk and showboat for awhile because it fits their character as opposed to making any sense at all. -- sometimes plot convenience just overtakes common sense even if you suspend disbelief for the steampunk aspects: at one point a character who has been stabbed through both thighs with a spear gets up and outruns healthy Somali warriors. Really? Not just stabbed in one thigh but in both thighs? Really? Overall the good stuff was things I like and the bad stuff was the kind of things I can gloss over so it was 4 stars for me but if the you have read any of these bad points and thought to yourself "it makes me nuts when they do that" this will probably be a 2 star or even a 1 star book for you. For some time I have been looking for a book that could live up to the possibilities presented by the steampunk genre and have largely been disappointed. While books such as Perdido Street station, Terminal World and Boneshaker have all had promise each one has failed to to both convey the technology and culture of a steampunk world while also being a good story in regards to the fundamentals of storytelling such as narrative flow and relatable characters. The curious case of Spring Heeled Jack however is THE book that steampunks have been looking for and the perfect introduction to those new to the genre. It is both original and historical, filled with fantastic machines and creatures on par with the best alien worlds of fiction. There are characters of surprising depth and exciting action scenes both all set in an alternate "victorian" era. Unlike most alternate history fiction the changes in history here are not merely to suite the authors convenance but are an actual result of the story itself making this not so much an alternative history as it is a time travel epic. It manages to be fanciful without being too bizarre to relate to and unlike many authors of this genre this author remembers that no matter how interesting the world you create may be the characters must be the foundation of the story if we are to care at all about the plot. The story unfolds first from the perspective of an man hired to investigate some of the stranger happenings in what from our perspective is a radically changed and bizarre world and then later from the point of view of a man from our future trying to deal with his own past and the changes that occurred to the timeline. 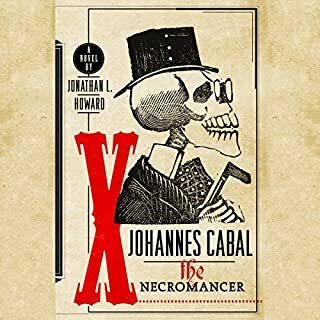 It is in this second part of the story that this book truly shines when we listen with growing horror and fascination to the sequence of events that have lead to a 19th century england so different from our own. Any fan of time travel will love this story and the classic paradoxes it copes with as will anyone who has studied the social and scientific changes of the victorian era and wondered, "what if"
At last steampunks have a book they can be proud to recommend as an example of the genre without an excuses or caveats to the fantasy or sci-fi fan. 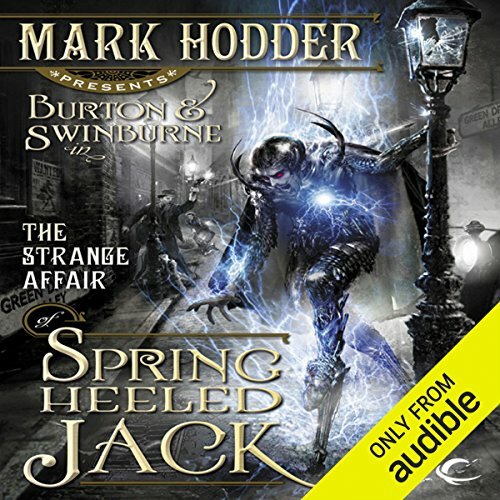 What made the experience of listening to The Strange Affair of Spring Heeled Jack the most enjoyable? Gerard Doyle's ability to flawlessly define every character and give them unmistakable personality was a pleasure. The clever story gives steampunk a reason to exist central to the plot and chases it's own tail through all three books! Richard Francis Burton, the genius adventurer is the picture of the african explorer! He is an honorable man of action! What does Gerard Doyle bring to the story that you wouldn’t experience if you just read the book? His characterizations add a dimension to the characters that transcend the written word. Yes, it was a wonderful epiphany. This book truly puts the PUNK in Steampunk. It uses the genre as it SHOULD be used, to examine the ethical conflicts inherent in rampant technological progress. Thus making it relevant to the world we live in. Steampunk is all the rage nowadays. The Strange Affair of Spring Heeled Jack seizes the trend in an intriguingly weird story that turns history on its head, thanks to the inept bungling of a time-traveler who, in our world, was one of the most notorious urban legends of Victorian England. I am not really a huge fan of steampunk. Actually, to put it bluntly, I think most steampunk is stupid, an excuse to mix corsets and Anglophilia with science fiction. But I enjoyed this book a lot. It's rip-roarin' well-plotted adventure, with a fine attention to historical detail if not scientific plausibility. There are lots of things Mark Hodder does right. His alt-history is a colorful blend of historical figures and fanciful inventions. It's not science, it's Science! When a time traveler from the 22nd century goes back in time to 1840, the date on which 18-year-old Edward Oxford attempted to assassinate Queen Victoria, he inadvertently causes the assassination to succeed. The changes that result from Victoria's death are not merely the loss of "Victorian" England, but a 19th century England in which Technologists build ornithopters and geothermal power stations and air trains, while eugenicists engineer messenger dogs and parakeets, house-cleaning cats, and elephantine horses. Meanwhile, Libertines and Rakes are rival factions preaching a complete overthrow of the social order. Mesmerism and other "magical" practices are real, and genetic engineering on humans is beginning. Adventuring, two-fisted pulp style, in this steampunk bizarro world are the famous explorer Sir Richard Francis Burton and the poet Algernon Swinburne. Burton crosses the sinister time-traveling "Spring Heeled Jack," thus becoming ensnared in his calamitous attempts to unscrew history. The use of actual historical figures is cleverly done. According to 19th century lore, Spring Heeled Jack was some sort of diabolical deviant, running around England sexually assaulting women by tearing their clothes off. Hodder actually comes up with a logical explanation for "Jack's" behavior, and for how the loon could be a time traveler. I also appreciated his use of historical personages and events. Edward Oxford was a real person, and his attempted assassination of Queen Victoria is a historical fact; Hodder makes strange fiction out of it. He uses real people like Richard Burton, Algernon Swinburne, and Lord Henry Beresford of Waterford, with cameos by Oscar Wilde, Charles Babbage, and others. I was particularly amused at the eeeeeeevil evolutionists being led by (spoilers removed). There was no insertion of overtly fictional characters — i.e., no Sherlock Holmes or Allan Quatermain. It's almost like a bent world that might have been. That said, this book gets 4 stars for story and content, 3 stars for writing. I suppose some of the writing tics that bugged me may have been a deliberate attempt to emulate the writing style of Victorian pulp adventures, hence Sir Richard Burton constantly being referred to as "the King's agent." But having long chapters of exposition narrated to us by the expedient of characters eavesdropping on the bad guys as they conveniently monologue their life history and then spell out their plans in detail? Lazy. Entertaining as heck, but lazy. Hodder is a great storyteller, and the pace never flagged, even during the monologues, but the plotting was sloppy. And like most steampunk settings, there's a lot of suspension of disbelief required, since steampunk cyborgs, talking orangutans, and genetically-engineered housepets are not a logical consequence of killing Queen Victoria, even with a time traveler letting slip a few hints about the future to inquisitive 19th century scientists. Still, accept that history has been kicked onto its side and anything goes, and the plot flows right along. A great read for any fan of steampunk, an entertaining read for fans of historicals who don't mind fantasy. Good enough for me to consider the next volume in the series when I am in the mood for a beach read. I like steampunk, I like science fiction, and I like Victorian history, so I should have loved this, but I didn't. There is nothing horribly wrong with book, but there is little particularly wonderful either. Rather than big issues, I found that lots of little choices ultimately undermined the book. A sense of place is key in these sorts of historical fantasy novels, and while Hodder gets a lot of obvious references in - London smog, classism, formality, and so on - it feels repeatedly undermined by little things. His characters frequently use anachronistic language (I assume "Great Scott!" feels Victorian, but it is of more modern American use, not a big deal in itself, but typical of the sloppiness), characters are drawn with very broad brushes, and London feels like a set of stereotypical Dickensian elements, rather than a coherent whole. The sense of adventure is similarly undermined by plot choices. The reader is often led to understand certain things hours before the hero does, for no clear purpose. People have a tendency to suddenly declare important clues as characters seem to randomly stumble into key plot points. New technological elements are introduced as needed, without a real consistent sense of what the limits of the "technologists" are. And the main character is constantly referred to by the third person narrator as "The Great Explorer" or "The King's Agent" as in "The Great Explorer said X." None of these are fatal flaws, but, by the end, they weighed the book down too much. Again, if you really like steampunk fantasy, you could do worse, but otherwise this book is adequate at best. Would you try another book from Mark Hodder and/or Gerard Doyle? Gerard Doyle did a great job narrating this story and I would certainly listen to other recordings of his. Would you be willing to try another book from Mark Hodder? Why or why not? I'd be willing to try another book by him, as he had some very good ideas. Unfortunately, he also had some very weak ideas and sometimes, it felt to me that there was a very simple and reasonable motivation available that he consciously avoided, in favor of a convoluted and unreasonable motivation. Which character – as performed by Gerard Doyle – was your favorite? Doyle's performance of Spring Heeled Jack was great - I didn't like the way the character was written, but he was performed well. This book was a real mix of highs and lows. The explanation for the existence of a Steampunk Victorian era is fantastic. The depiction of one character's decent into madness is great. On the flip-side, the reason that character goes insane is paper thin, and I felt that there was a very good, accessible reason for him to begin going insane, that the author avoided. The antagonists in the book are extremely weakly written, their motivation feeling shallow and unbelievable. It feels to me like they were thrown in there because the book needed an exciting climax and that they were made to do cruelly evil actions up until that point so that the reader would appreciate that they are indeed bad guys. I suppose that's my major complaint - they are depicted as shallow Saturday morning cartoon bad guys, rather than being antagonists. Finally, the ending left me thinking "uh, what?" as the "moral" of the story was revealed. I think that I see what the author was going for, but I don't think that it was really achieved. I had a basic understanding of what steampunk was before I started Spring Heeled Jack, but what I found was a masterful amalgam of historical fiction, fantasy, sci-fi, philosophy, and detective-style mystery. Gerard Doyle does an amazing job jumping between all the different accents of 1860s England, where fights were won with a well-placed right cross and a stinging one-liner. Before listening, you will need to pack a bag for your disbelief and send it on a nice, long vacation (Foul-mouthed messenger parakeets? Check. Packs of hooded werewolves kidnapping chimney sweeps? Double check. Genetically modified and mechanically enhanced historical figures? More checks than you would even believe.). The voices and performance were great. I may be a sucker for the British accent...but really enjoyed it. The story was fast and interesting, but ultimately the pieces didn't fit that smoothly in the end. It also seemed to spin out of control and push things too far for my "suspension of disbelief." But Burton and Swinburne were intriguing and different characters. And the story took enough turns to keep me guessing. No masterpiece, but definitely a fun read. Overall I thought the book was fun to listen too. The story was good and kept me interested and involved the whole time. The steam punk portions of the book were fun but at times seemed a bit too fantastical. The narration was okay. Not great, but not bad either. The main thing that really bothered me about this book is in the last 1/3 of the book the author not once, not twice, but three times retold portions of the story he had told earlier in the book. Granted, he told them from a different perspective, but still, we already knew these things had happened and telling them from a different perspective added nothing to the story nor progressed the story in any way. I did think the length of the story was good. The author maintained the flow of the story and didn't really waste the readers time (with the exception of the retelling in the last 1/3 of the book). It was a pretty quick listen, fun, and imaginative. 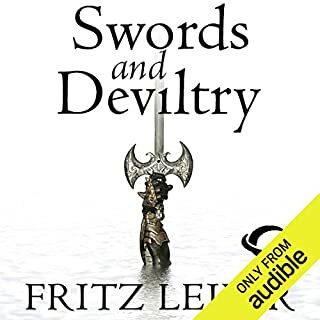 I liked the story enough that I will definitely listen to the next book in the series. I'm fairly new to the steam-punk alt-history genre but I quite liked this book. 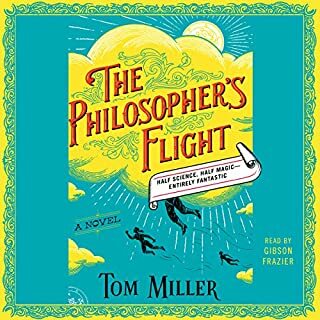 That's not to say that if you think about it too hard the book was perfect, but as an enjoyable listen, it was great. The narration was excellent. I really liked the level of technology in the book, seemed mostly believable enough. I have to say that the big confrontation scene at the end of the book was rather anti-climactic, but that's just me. I'm not sure that I will get the next books, certainly if I did, I'd try to find them on sale.